"This is one of those books that you read and then have to sit back or curl up in a ball and 'be still and know.' In these honest, tear-stained pages are clear signs that there is a 'Hound of Heaven' hunting us down—this Spirit that is stalking us with love, winking at us with miracles, tickling us with grace, subverting everything that could destroy us, and whispering in our ears that we are truly beloved." Love God, but not so sure about church? If you've ever had doubts or felt the gnawing need to examine your interior life, you'll find a trustworthy companion in Enuma Okoro, a purse-shopping, tea-sipping, shaky follower of Jesus who wouldn't mind meeting a guy who loves God and has decent hair. But after her father's unexpected death, her grief seems to morph into the panicky feeling that God wants something more from her, like maybe becoming a nun. As she seeks to unravel those feelings, Okoro takes us back to the places that formed her, from her first years in church at a parish in Queens, New York, to her years in West Africa where she collected crucifixes along with Richie Rich comic books, to her studies in Europe and the United States. 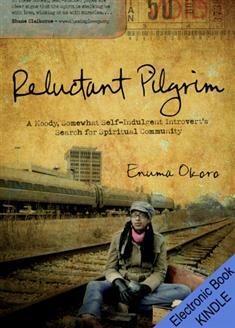 Part Augustine, part Jane Austen with a side of Anne Lamott, Okoro attempts to reconcile her theological understanding of God's call to community with her painful and disappointing experiences of community in churches where she often felt invisible, pigeonholed, or out of place. At turns snarky and luminous, laugh-out-loud funny and vulnerably poignant, Reluctant Pilgrim is the no-holds-barred account of a woman who prays to savor God's goodness and never be satisfied. It is a daring, insightful, and deeply moving field guide for the curious, the confused, and the convicted.